This fudge was (all gone now) smooth, delicious and rich. It was super easy to put together, and in a few hours, after cooling, was ready to eat. No candy thermometers were needed, just a few microwavable bowls, and a 9″x9″ pan to pour it all into. Line an 8x8-inch or a 9x9-inch baking pan with foil or parchment paper. We used 2 pieces, so that they crossed, and all 4 walls of the pan were covered. This makes for easy removal from the pan. In a microwave safe bowl, mix semi-sweet chocolate and sweetened condensed milk. Microwave on medium for 2 minutes, stirring after 1 minute. Stir until chocolate is completely melted. Stir in the peanuts. Spread into prepared pan. Place in refrigerator until the next layer is ready. In another microwave safe bow, melt white chocolate on medium for 1 1/2 minutes or until the chocolate is almost melted, stirring after 1 minute. Stir until the chocolate is completely melted. Add the peanut butter, and stir until melted. Spread over the semi-sweet chocolate layer. Refrigerate for 2 hours, or until firm. Cut into 1-inch squares and serve. Wow, how very fortunate that your husband likes to cook, and bake. These look delicious. Absolutely, Sandy! Just melt your chocolate in the top of a double boiler. I like to use a pyrex bowl over a saucepan with 1″ or less of simmering water. Jeanine, seriously. These could look any more perfect! I totally think we are going to make these tomorrow! My Mom and boys and I decided that tomorrow we are going to hang out in the kitchen all day baking and making treats for the huge family gathering at my In Laws tomorrow night! These will be gone in a minute if we bring these!! YUMMO!! Yum! Your husband and my daughter must be on the same wavelength. 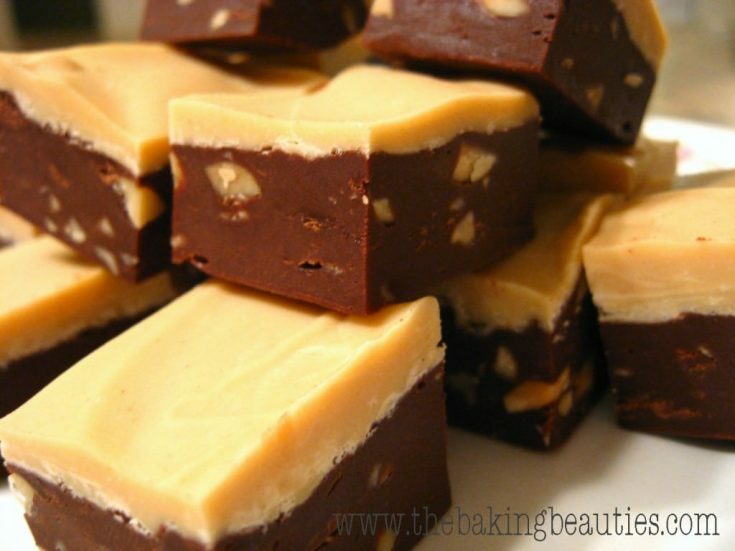 She just made peanut butter fudge too! Oh Jeanine! I was so busy (and sick!) before Christmas, I missed this but my god, it looks amazing. I want to bite my computer screen. I am saving this one, even if I can't eat much of it and have to give it away. Happy New Years! Cant wait to look through this site some more..
Wow! I can’t believe I have never come across your site before! I think I am in serious trouble… all of the things that I have longed for are all here in one place. BTW.. I love the design of your page! Also thanks for providing the pics as well. I am very visual and it messes me up if I don’t have a pic to refer to, lol! Funny, I was attempting to put together a cook book of all of the things that I have found because there was so little out there… but now I see that you have done the work already. I know there are others, but there is many recipes that I have no interest in… but this place is phenomenal! Thanks again!!!! I made these for my celiac support group cookie exchange last night and everyone was raving about them!! Thank you so much for sharing!! Made these this week! Awesome recipe and super easy! Hello, can you please tell me approx how many grams are the below? Mine did not work out. Cant beleive it. looked so good, but nope.